Happy St. Paddy's Day to all my kitty friends and their humans! Happy St Pat's Day to you too! That is so cute!!! Happy St. Patrick's Day! Happy St. Patrick's Day. LOL! 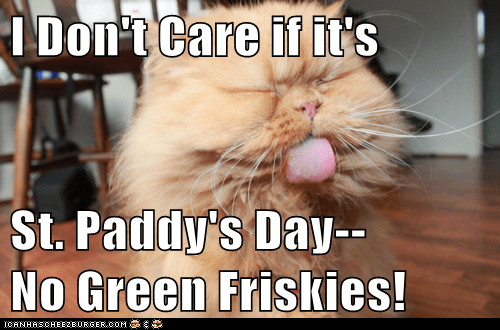 I don't think I would want green Friskies, either, but I love my Greenies. Haha! Happy St. Patrick's Day!! Ha! My Denties are green!! Green Friskies? Maybe not so much. A polite way of saying Ewwww.